During the Yuan, Ming, and Qing periods, in addition to producing porcelains for Chinese emperors and the domestic Chinese market, the kilns at Jingdezhen in Jiangxi Province also manufactured wares for export. 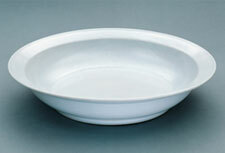 Strong, white, and translucent Chinese porcelain came to be desired and coveted by rulers around the world. The Mughal emperor Shah Jahan (reigned 1627–1658), who is famous for building the Taj Mahal, was a great patron of the arts and a collector of ceramics. 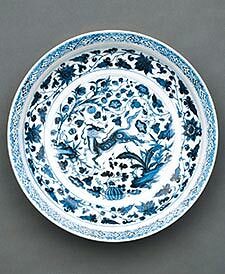 Imperial Mughal memoirs and European accounts of the Mughal court refer to a high regard for Chinese porcelains. Porcelains inscribed with the name of Shah Jahan, his predecessor Jahangir, and his successor Aurangzeb make it clear that Chinese ceramics were cherished by generations of Mughal emperors. It is possible that the emperors had the ceramics inscribed as marks of ownership or that they had been inscribed as gifts from their Persian or Turkish counterparts. Decorated with traditional Chinese motifs conveying wishes for good fortune and blessings, this platter exemplifies the type of ceramics exported to the Middle East during the Yuan period. The large size of this platter also reflects its intended market, where food was customarily served on large dishes to a group of people. An inscription (on the outside of the footring) documents it as one of the few known examples of Yuan-period porcelains preserved in India. Written in Farsi, it cites the name of the Mughal emperor, Shah Jahan (reigned 1627–1658) and gives a date that corresponds to 1652/1653 in the Western calendar. This large, glazed porcelain platter has the name of the Indian Mughal emperor Shah Jahan (reigned 1627–1658) inscribed in the glaze on the exterior. It is not clear why Mughal emperors had certain pieces such as this platter inscribed with their names, but it is possible that the names were engraved as marks of ownership or lineage.